Barbie has nothing on this Hollywood entertainer with a knack for whimsical decor. A famous frog once said that "it's not easy being green." Maybe he should have tried being pink instead. Kitten Kay Sera, known as "The Pink Lady of Hollywood" and "The Queen of Pink," has been exclusively wearing the rosy hue since 1980. Fast forward a few decades and today, Sera not only wears pink 24/7 but her entire apartment is outfitted in various shades of the cheerful color. 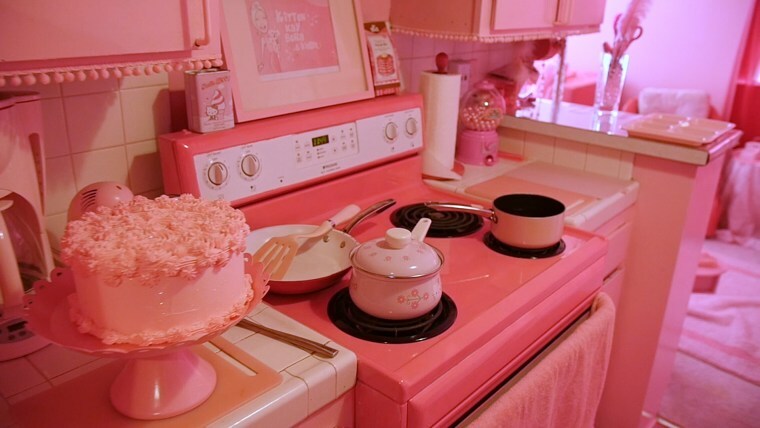 From her bedroom to the bathroom, and every other nook and cranny outfitted in pink, Kitten gave TODAY Food an inside look at her "purr-fectly pink" kitchen — and even cooked up a blushing breakfast complete with pink pancakes and eggs for the latest episode of "Crazy Kitchens." Sera, who is also a recording artist, calls her home "The Pink Palace." "I consider myself a monochromatic — that's a person who does one color only," said the Queen of Pink. "I would never wear another color. I'll be in pink 'til the day I die, darling." Although she's constantly redecorating with new pink items (Sera estimates she's spent about $1 million so far), she finished overhauling her kitchen in 2007. Unique touches include a shiny tabletop jukebox, plenty of pink candy like pink-only Starbursts and pink-wrapped Hershey Kisses. She also has bright pink stove, complete with sets of pink pots and pans. "The food items I always have in my refrigerator [are] pink milk and pink lemonade," Sera admitted. One of the most unique collectors' items is a Hello Kitty Microwave (which really works!) that Sera found on eBay for $150. Sera has truly committed to her craft and not only adds red food coloring to everyday breakfast staples like pancakes, she even dyes her boiled eggs by soaking them in beet juice! When she's not whipping up stacks of pink food in her kitchen, Sera is singing to legions of devoted fans (she has over 105,000 followers on Instagram) or cruising around Los Angeles in her custom-built pink convertible. I don't give a damn what ya think. Wearing pink from my head to my feet! I love the way I feel. In this big pink life of mine.